One of Ikea’s Choklad Lingon & Blabar chocolates unwrapped. This is a milk chocolate Lingonberry one. The Swedish food market at Ikea is a must-visit whenever I get to the big blue-and-yellow box store. Aside: How much do I love Ikea? I’m typing this on an Ikea desk while sitting in an Ikea chair. Next to me are Ikea bookcases and an Ikea Poang chair. I could keep going (Ikea coat hangers, Ikea table lamp … ), but I won’t. You never know what they’re going to have in stock at the food area of Ikea. There are the standards like frozen meatballs, but there are also seasonal and randomly available treats that come and go. I’m not sure if my recent trip to Ikea was the first time I saw these or if I’d simply failed to notice them over the trays of cinnamon buns and jars of lingonberry sauce. 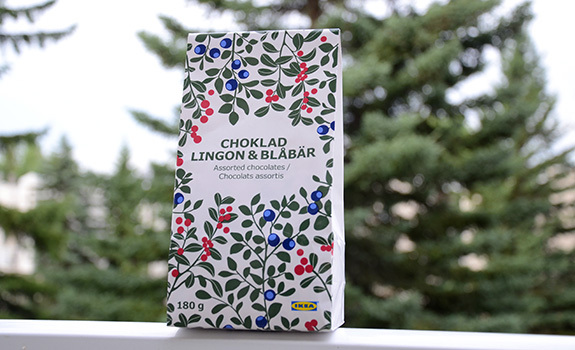 I enjoy lingonberries, blueberries and chocolate, so for four bucks, this bag of Ikea Choklad Lingon & Blabar chocolates seemed a reasonable gamble. The Pitch: “Assorted chocolates – milk chocolate with lingonberry, dark chocolate with blueberry.” Produced in Spain for Ikea. Are these larger bits of fruit wrapped in chocolate, or chocolate with the fruit flavour mixed throughout? That’s entirely unclear. The Look: Retro line-art utilitarian. 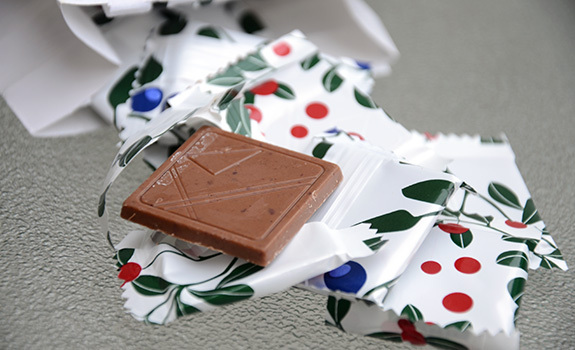 A paper/plastic bag filled with individually plastic-wrapped thin squares of chocolate. I think I was expecting them to be round, given the similarity to the bag-style packaging used for Lindt’s Lindor chocolate balls. Lingonberry-flavoured squares have wrappers with little red circles on them, while the blueberry-flavoured squares have little blue spheres on their wrappers. The Taste: The lingonberry squares are inferior not because of the fruit – which is OK, if not particularly identifiable as lingonberry – but because the milk chocolate tastes so cheap. I was instantly transported back to junior high, when one of my teachers gave out chocolate from the dollar store to reward students. It’s got a stale, canned-milk twang with a waxy texture. By comparison, the blueberry dark chocolate squares are nicer. The blueberry flavour is more intense than the lingonberry, and the chocolate is less intensely sweet. It still tastes cheap, but it’s not quite as obnoxiously so. A bag of Ikea Choklad Lingon & Blabar chocolates. Cost: $3.99 for a 180 gram bag at Ikea in Calgary. Nutrition? : Per 9 assorted pieces (41 grams): 220 calories, 13 grams of fat, 16 mg of sodium, 3 grams of fibre, 2 grams of protein. The verdict: Pass. If you want blueberry or other fruity chocolate, try the line from Brookside. You can find them for around the same price, but the quality is way better.